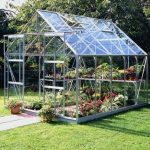 The 4×6 polycarbonate extra tall greenhouse from Waltons is a low cost, high quality model. It benefits from a basic, yet stylish design. 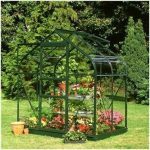 With an attractive green powder coat finish, this greenhouse comes with some fantastic features; ensuring it offers exceptional value for money. Its extra-tall build makes it especially great for gardeners specialising in climbing plants and produce. It also makes the greenhouse more comfortable and spacious to use. Shatterproof polycarbonate twin wall glazing is used to enhance its safety; giving you peace of mind if you have children or pets. There are a few of features which set this greenhouse apart including integrated guttering, a sliding door and a robust aluminium frame. 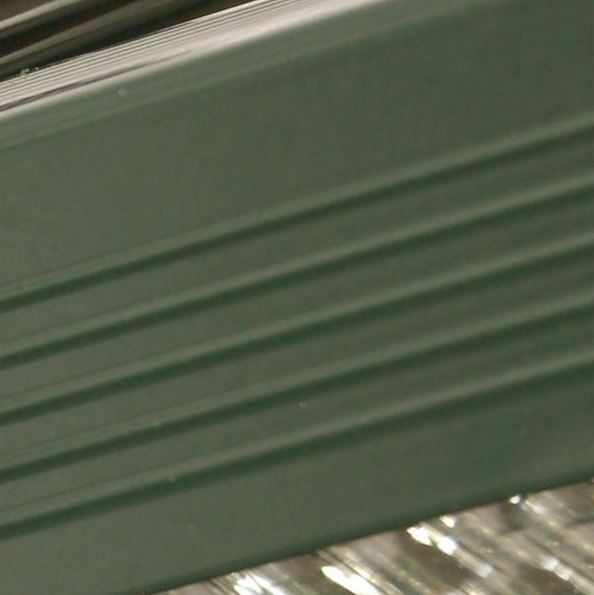 The guttering provides more effective rainwater drainage, protecting the greenhouse from rust. The sliding door stays open when you need it to and also saves space, making this ideal for smaller gardens. The greenhouse also benefits from clip installation. This is designed to ensure that the panels fit quickly and easily together, speeding up construction time. All in all if you’re looking for an inexpensive, high quality greenhouse then this is one of the best on the market. The fact it also looks good compared to a lot of other greenhouses available is an added bonus. Doesn’t come with a floor so will need a sturdy base for it to be built upon. This is a glazed, aluminium framed entry-level greenhouse. Compared to other models, it benefits from an extra-tall design. It also comes with a spacious, yet compact depth making it suitable for most gardens. No measurements are given for the door and this is largely because it is a sliding variety. So the amount of access granted into the greenhouse is wider than you’ll find on many of its competitors. This does need to be built on top of decking or a patio as it doesn’t come with a floor included. You do have the option to buy a base at an additional cost, but this isn’t an actual floor. Therefore it’s highly recommend you build the greenhouse on top of concrete or paving slabs. 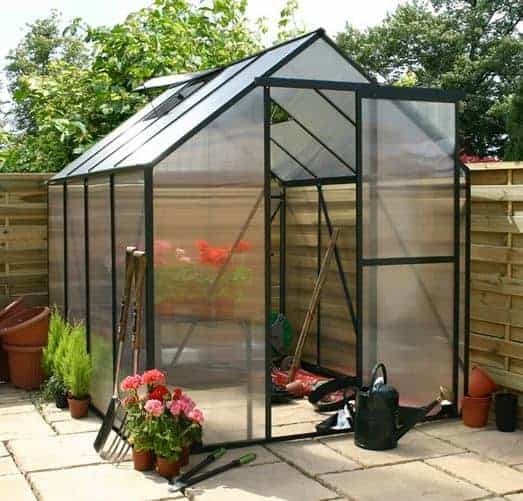 Of course the advantage of this design is the fact you can store practically anything in the greenhouse without having to concern yourself with whether the floor will handle the weight. The roof features the same polycarbonate glazing as the walls. This ensures a large amount of sunlight gets through to the plants and encourages them to grow healthier as well as quicker. It has an apex shape, ensuring water runs efficiently off the roof and into the integrated guttering. Built with twin polycarbonate 4mm glazed walls, this greenhouse is one of the safer models available. The glass is totally shatterproof which is a weight off your mind if you have young children. Not only is the glazing safer if it is broken, but it also has the benefit of being harder to break. Its thickness ensures the interior remains well insulated even in colder weather. However, if you’re planning on growing plants that require a hot climate, we’d also suggest buying the heater that Waltons offer as an extra. The glazing has also been UV treated which protects both the panels and your plants. Strong UV rays can damage some plants so this is a very important benefit for the keen gardener. A very robust aluminium frame is used to hold the panels together. Providing extraordinary stability, this frame has a stylish Forest Green colour. It is also highly resistant to rust and is guaranteed to last at least 5 years. Of course, there’s also the added benefit that you don’t have to treat the frame like you do with wooden models. The sliding door is one of the more unique features of the greenhouse. It offers maximum convenience and as mentioned earlier, it also saves space. You simply slide the door completely open and it stays open whilst you easily manoeuvre in and out of the building. The door is also glazed just like the rest of the greenhouse. Obviously as the walls and roof are fully glazed, it doesn’t need windows. There is an opening vent in the roof however which ensures you can get air into the building to regulate the temperature when needed. This greenhouse isn’t built with storage in mind. It is purely a space to grow plants and flowers. Therefore there is no security added to the greenhouse. There isn’t a lock on the door and you will struggle to add one. Therefore we only recommend using it to grow, pot and carry out other gardening related tasks, rather than combining it as a storage facility. If you’re willing to spend a little extra on this building, there are a few useful extras you can benefit from. 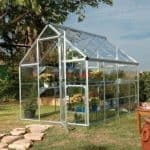 As standard, the greenhouse isn’t sold with a base, but Waltons do give you the option to include one for an additional cost. 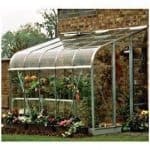 It is recommended you invest in this sturdy polycarbonate grip greenhouse as it will make installation a lot quicker and ensure the building is also structurally secure. A Lifestyle Greenhouse Gas Heater is also available and we’d recommend this for use during the cold, winter months. At 1.9kw, this heater is economically friendly and especially useful for plants that require a hotter climate than the UK weather can naturally provide. 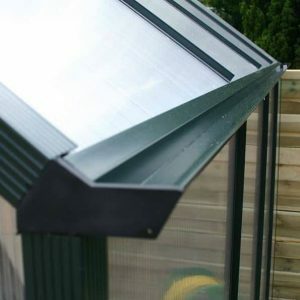 Your last option is a rainwater kit which connects to the greenhouse and filters rainwater down into a container of your choosing. If you’re a keen gardener you will know how frustrating it can be in the summer months when there isn’t as much rainwater to keep your plants properly hydrated. Collecting the water when it does rain will help you cut back on your mains water usage and therefore save you money in the process. 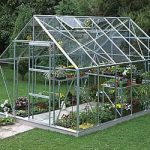 This is an excellent quality greenhouse, made from strong polycarbonate and aluminium materials. It may have a simplistic build, but for the price it really is one of the highest quality buildings you can invest in. 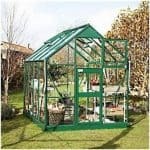 The greenhouse does come with a 5 year warranty, but there are longer lasting models available. However, for the price its longevity is fantastic; especially as it requires absolutely no maintenance. This is one of the smaller greenhouses available, though it does provide a good amount of growing space. It is especially generous in height and will definitely suit the amateur gardener. Though the clip panel installation does make it easier to put together, it is still likely to take you a lot of time to put together. Some customers have stated it takes around 4-5 hours to assemble and it is recommended you buy the base to ensure a sturdy build. The affordable cost of this greenhouse is fantastic. Despite being a budget model it offers exceptional quality and plenty of great features. Final Thoughts: It’s surprising how many great features this low cost greenhouse comes with. We are especially impressed by its remarkably robust structure. 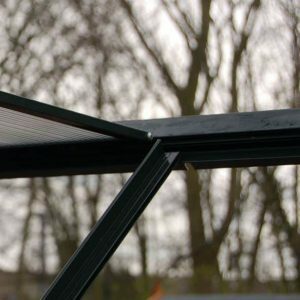 Finished in a stylish Forest Green colour, the greenhouse comes with a great 5 year warranty. Integrated guttering and a sliding door make it stand out from the competition and the 4mm twin wall polycarbonate construction ensure the building is well insulated all year round. There is also a roof vent to help keep the building ventilated in particularly hot weather. Several extras are also available to help you get the most from the greenhouse. All in all this is an excellent choice for any gardener and it should fit into most gardens.